China already has an FTA with Pakistan and is currently negotiating a deal with Sri Lanka. New Delhi: The Maldives will soon become the second country in South Asia, after Pakistan, to enter into a free trade agreement (FTA) with China, after it was passed on Wednesday evening by parliament in an ‘emergency’ sitting. The text of the FTA was concluded in September after two years and five rounds of negotiations. Two months later, Maldivian President Abdulla Yameen decided to sign the FTA in a cabinet meeting on Wednesday afternoon. This is the first bilateral FTA to be signed by Maldives. The Indian ocean nation had previously signed the South Asian Free Trade agreement in 2004. According to the presidential office’s communique, the FTA will “enable exemption of duties on fisheries products exported to the world’s largest consumer market”. Immediately after the cabinet decision, the agreement was submitted to the People’s Majlis (parliament). The Maldivian news source, Mihaaru, stated that the national security committee of the parliament took about half an hour to complete its evaluation process. “Over 500 documents were submitted to the parliament for the “Free Trade Agreement Between the Government of the People’s Republic of China and the Government of the Republic of the Maldives”. 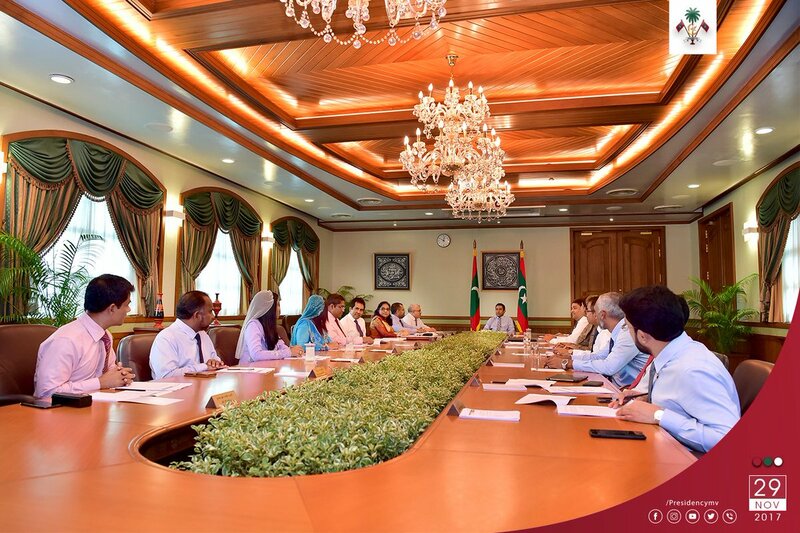 However, the committee’s final report did not specify whether each member had individually evaluated all the points of the agreement,” said the Mihaaru report. The Maldives Independent reports that there had been no regular sitting scheduled for Wednesday – the last sitting day of this current session. However, MPs were suddenly informed that an “emergency” session would take place at 2:30 pm on Wednesday afternoon. Around 12 opposition lawmakers had been summoned to the criminal court over charges of obstruction, but were told only at 3 pm that the hearing was rescheduled. The Maldives Independent noted that several opposition MPs received text messages after the sitting began. The opposition have not been attending the current parliamentary session in order “not to give legitimacy” to the Speaker Abdulla Maseeh Mohamed. After the parliamentary panel’s report was read out to the entire Majlis, only one MP spoke – in favour – before the voting. With the opposition not in the chambers, the motion to support the agreement was passed unanimously by the 30 MPs present. The total strength of Majlis is 85 seats. The principal opposition party, the Maldivian Democratic Party (MDP), said that it was “deeply concerned over sudden and rushed Free Trade Agreement (FTA) with China, without any disclosure of details to the public or to the MPs”. In a press release issued on Wednesday night, the opposition claimed that the parliamentary speaker had to convene an “emergency sitting” to urgently pass the China-Maldives FTA. Understand Parliament has begun an emergency sitting. Several Opposition MPs including I have not been notified of the meeting. Ratification of a free trade agreement between Maldives & China is on the agenda! Why the rush? Why the irregularities? The sitting is not legitimate! The Maldivian opposition further alleged that “within minutes of submission” of the agreement to the parliament, it was referred to the panel for evaluation. MDP claimed that that the committee vetted the agreement in 10 minutes, with the closed-door process violating all laid-down procedures. “Despite requests, the MPs were not given access to the document in order to review it before passing. The Government allowed for less than 1 hour for the entire Parliamentary process to approve the 1000+ page document,” said the MDP statement. The opposition further stated that the approval with just 30 votes in the 85-member house was not legally tenable. “The MDP notes that the Attorney General of the Maldives had advised corresponding legislation for the Agreement to be legally binding. The Constitution requires 43 attending to pass legislation on this, and the Government does not have the required votes. The FTA cannot be implemented until the legislation is passed,” the party said. The MDP was pointing to Section 87(b) of the Maldives constitution, which states that “voting on any matter requiring compliance by citizens shall only be undertaken when more than half of the total membership of the People’s Majlis are present at the sitting at which the matter is voted upon”. The opposition further asserted that there were concerns the FTA would further increase the trade deficit, which was tilted in China’s favour. “We are also deeply concerned that further entrenchment of the country into a Chinese debt trap will result in additional stress on strategic national assets and increasing instability in the Indian Ocean region,” the MDP added. The statement said that allegations of corruption against the Maldives government, coupled with the “evasive behavior on any projects courting foreign trade or investment adds to public consternation”. The MDP demanded that the implementation of the FTA with China should be “suspended” till a proper feasibility study is conducted “to ensure the Agreement is in the best interest of the Maldives both economically and also to ensure the Agreement does not place Maldives in a geo-politically vulnerable position”. Opposition sources claimed that the urgency in obtaining the parliamentary approval for the FTA was related to President Yameen’s forthcoming visit to China in December. However, the visit has not yet been officially confirmed. Pakistan was the first country in the subcontinent to sign a FTA with China in 2007. China is also negotiating a FTA with Sri Lanka. The Maldives’ main exports are from its fishing industry – mainly destined for Europe. However, that market has become more difficult as EU revoked its duty-free status after the Maldives graduated from a lower income country to an upper middle-income nation. After the first round of FTA talks in 2015, the Maldivian economic development minister Mohammad Saeed noted that the “main aim is to export [fish products] to the China market without any tariffs”. When the final round of talks was completed in September 2016, the Chinese commerce ministry said that the agreement would reduce the tariffs of “95% of goods to zero”. The press note also added that the deal allows for “opening the service market such as finance, healthcare and tourism”. 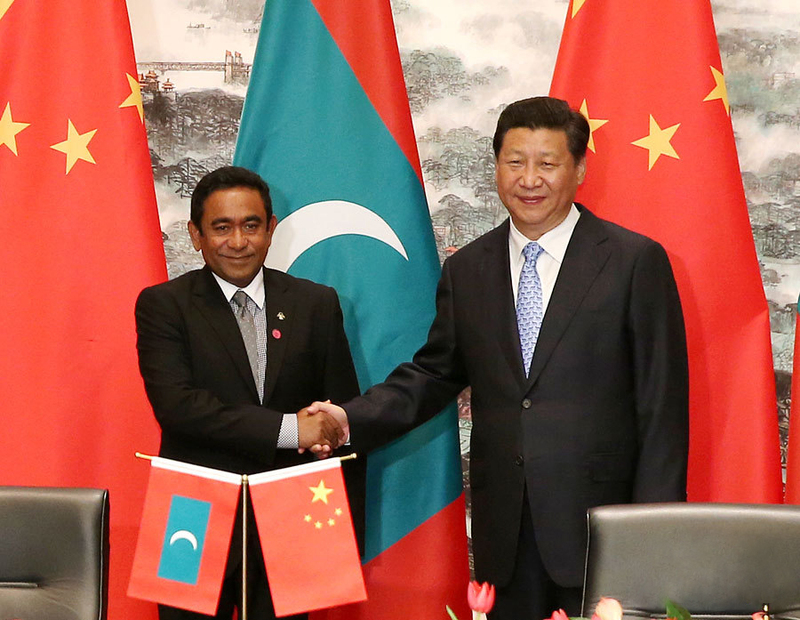 The signing of the China-Maldives FTA again raises questions about Chinese influence on the archipelago nation, which is located at a strategically important position in the Indian ocean. India had been keeping an eye out on Chinese activities in the region, especially concerned about the possibility of military activities in atolls leased for tourism purposes. The first-ever visit by a Chinese president to Maldives in September 2014 led to the Indian Ocean nation becoming an official part of the ‘21st-century Maritime Silk Road’, which is now termed the ‘Belt and Road Initiative’. In a January 2015 media interview, the Chinese ambassador to Maldives said that “The MSR initiative will enhance Maldivian products like fish to be exported to China and cheaper and better Chinese products to be imported to Maldives by establishing Free Trade Area between the two countries”. India’s current relations with the Maldives are certainly not at their warmest. The Maldives had certainly read the ‘signs’ when a Delhi-based think tank had invited self-exiled opposition leader and former president Mohamad Nasheed for a conference in August. The rush to call an emergency session to push a legislation through parliament echoes the unusually quick passage of the second constitutional amendment. In July 2015, the Maldives passed the amendment to the constitution allowing foreign ownership of freehold land for the first time just a day after the legislation was tabled in parliament. India had been taken by surprise at the swiftness of the passage of the bill and became alarmed that it would could lead to increased Chinese military presence in the Maldives. After India expressed its concerns, Yameen assured Indian Prime Minister Narendra Modi that the Indian Ocean region will remain de-militarised.